From route 302 in Bretton Woods turn onto Base Station rd. At 4.5 miles turn left onto Jefferson Notch Rd and continue 3.3 miles to Jefferson Notch and trailhead parking on the right. I parked at the Caps Ridge trailhead and crossed the road entering the woods at an open area just north of the height of land. I followed a contour line between 3000 and 3100 feet elevation staying in the beautifully open woods as far and long as possible. bushwhacking was extremely easy through fern patches and mossy areas never getting thick or difficult. With the Dartmouth summit directly to my West I began ascending the steep slope. Terrain was a bit more challenging to navigate however the woods remained open 90% of the way. Found herd path with approximately 100 yards to the summit. Descended the same way following the 3100 foot contour line past the col between Dartmouth and Millen before bearing south to Millen hill. Bushwhacking up the slope was a little thicker but still relatively easy. Once on the summit dome I was presented with minimal views towards the Presidentials and followed a herd path 500 feet to the summit. Descended in a Northerly direction then changed bearing east following the open 3100 foot contour and Jefferson Notch rd. On a trail-less peak it's difficult to provide reference markers such as a trail junction, merge or other distinct object and the tables below reference the summit distance and times. Mt. 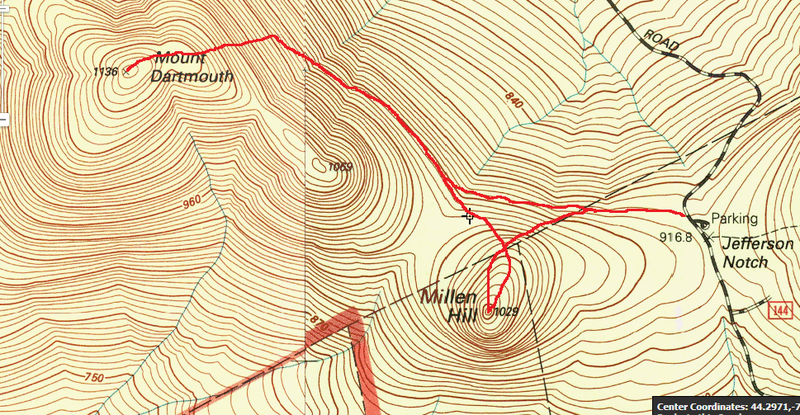 Dartmouth is the 67th highest peak in New Hampshire and nearby Millen Hill is on the list of 175 New Hampshire 3000 footers. Reports suggest following a contour line and ascending from a westerly direction. I stayed as low as possible for as long as possible turning due west and ascending about 1/2 mile distance and a few hundred feet elevation to the summit. The bushwhack from Jefferson Notch road is through open woods and one of the easiest bushwhacks I've encountered. Returning to Millen Hill I used the same philosophy following the contour then bushwhacking directly to the summit. Both summits contain a PVC canister and are viewless however Millen Hill offers a view to the Presidentials a few hundred feet from the summit. Looking for a specific mountain, trip report or blog post? 3 - The Horn - 3905 Ft.
5 - Shelburne Moriah - 3735 Ft.
6 - Mt. Sugarloaf - 3701 Ft.
7 - N Baldface - 3610 Ft.
8 - Success - 3565 Ft.
9 - S Baldface - 3570 Ft.
13 - Mt. 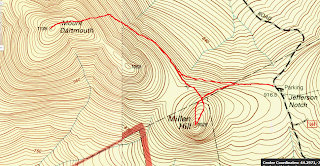 Avalon - 3442 Ft.
14 - Jennings Peak - 3440 Ft.
15 - North Percy Peak - 3430 Ft.
17 - Mt. Magalloway - 3383 Ft.
20 - Owl's Head (Cherry) - 3248 Ft.
21 - Smarts Mtn. - 3238 Ft.
25 - Mt. Monadnock - 3165 Ft.
26 - Mt. Cardigan - 3121 Ft.
32 - Mt. Shaw - 2990 Ft.
35 - Mt. Kearsarge - 2937 Ft.
38 - Stinson Mtn. - 2840 Ft.
46 - Mt. Israel - 2620 Ft.
48 - Mt. Roberts - 2582 Ft.
51 - Middle Sugarloaf - 2539 Ft.
3121 Ft. - Cardigan Mtn. 1 - Belknap Mtn. - 2384 Ft.
2 - Gunstock Mtn. - 2250 Ft.
3 - Piper Mtn. - 2044 Ft.
4 - (Mt. Klem) - 2001 Ft.
5 - (Mt. Mack) - 1945 Ft.
6 - (West Quarry Mtn.) - 1894 Ft.
7 - (Straightback Mtn.) - 1890 Ft.
8 - (Rand Mtn.) - 1883 Ft.
9 - (Mt. Major) - 1786 Ft.
10 - (Mt. Rowe) - 1680 Ft.
11 - (Mt. Anna) - 1670 Ft.
12 - Whiteface Mtn. - 1664 Ft.
13 - Durrell Mtn. - 1650 Ft.
1 - Mt. Shaw - 2990 Ft.
2 - Black Snout Mtn. - 2803 Ft.
3 - Faraway Mtn. - 2782 Ft.
4 - Mt. Roberts - 2582 Ft.
5 - Mt. Flagg - 2390 Ft.
6 - Turtleback Mtn. - 2390 Ft.
7 - Big Ball Mtn. (Tate Mtn.) - 2060 Ft.
8 - Bayle Mtn. - 1853 Ft.
9 - Bald Knob - 1801 Ft.
10 - Sentinel Mtn. - 1680 Ft.
Mt. Greylock - 3491 Ft.
Warner Hill Fire tower - 605 Ft.
All trip reports, maps, accounts, recollections and details in this blog are for entertainment purposes only and should not be used in real life situations. All photos are Copyright HockeyPuck. If you would like to use, rent, or borrow a copy of any photo, you will need explicit permission. Use the contact link below. 2004-2018 HockeyPuck Hiking Productions. All site matter is subjective. Do not attempt.. Simple theme. Powered by Blogger.